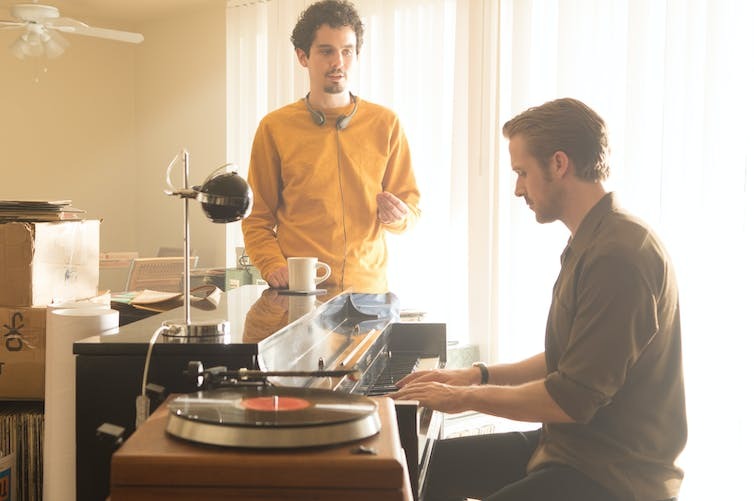 Having won five BAFTAs, including coveted awards for Best Film, Best Director (Damien Chazelle) and Best Actress (Emma Stone), La La Land is likely to win more statuettes at the Oscars – it has a record-equalling 14 nominations. Both lauded as the musical’s saviour and lambasted as “overpraised, overrated and disappointingly mediocre”, La La Land has divided critics. And as the film racks up award nominations, the scale of the backlash grows, with Richard Brody calling it “over-rehearsed” and Will Brooker accusing it of Trump-esque fakery. Film academic José Arroyo proposes that La La Land is suffering the same fate as older musicals once derided as “fluff”. This particular “fluff” consists of an everyday narrative about a temporary coupling between Mia (Stone) and Seb (Ryan Gosling). The film remains resolutely focused on the personal, with close-ups of the leads among the masses always honing in on that “someone in the crowd”. And with Ryan Gosling’s character crooning about the stars shining “just for me” from a heaving metropolis, the film’s sentimentality might well be mistaken for “fluffiness”. But the personal is always political. Take, for instance, the protagonists’ nostalgia for jazz and Hollywood. Mia points to classic film locations on the Warner Brothers set; Seb talks at Mia about his jazz heroes. The characters may be stuck in the past, but their personal predispositions for nostalgia remain relevant to the present, as their reflections make visible the racism and misogyny that historically impacted the people whose stories they appropriate. The film situates its two white leads in a crowd of silent, unnamed black characters in a jazz club, and features Seb commandeering black history and culture. Additionally, Mia, who uses her aunt’s story to win a part, relies on an invisible woman’s labour to succeed while also working invisibly as a playwright and stage actress herself. The characters’ personal infatuations do not so much suggest there was a more perfectly imagined past as reveal a world that has failed to make progress. As Pam Cook argues, nostalgia does not necessarily “stand in the way of historical analysis”. Inadvertently, La La Land’s nostalgia, coupled with its problematic representations of women and people of colour, asks us to reevaluate not only the past, but also how far we think we have come in the present. The film also creates an easy tension between the past and present through it’s structure. Whereas most musicals end either happily, as in Singin’ in the Rain, or with tragedy, as in Moulin Rouge!, La La Land defies resolution. It is predicated on loops and refrains: Mia and Seb look back to the past; film history is recycled in visual and aural motifs; Seb replays the opening bars of a record; Mia rehearses (unseen) her show; musical refrains such as City of Stars return; the seasons progress not just winter through fall, but back to winter. Consequently, neither the characters, nor the audiences, can fully escape into musical genre fantasy. As the narrative plays out, we might read it as metaphor for a broader historical trajectory that is neither straightforward nor linear. Instead, it is cyclical, and like Seb returning to his old job only to be re-fired for still not sticking to the set list, bound to repeat mistakes despite knowing the past. Historians now repeat cautionary narratives about fascism and authoritarianism in a manner akin to Mia and Seb’s reiteration of the histories of film and jazz through nostalgia. But such knowledge is not enough to guarantee change. As Mia suggests, we might “trace it all back to then” but then “do it again” regardless of the consequences. As such, La La Land actually represents a dystopian world similar to our own, in which being historically aware does not necessarily safeguard us from an uncertain future. And throughout the film, the use of repetition, and the frustrating ending, make viewers acutely aware of this lack of foresight. Yet, for all the film’s doubling back, La La Land does offer hope. It suggests that music, film, and the “poets, and painters, and plays” enable us to transcend the material world. And the film’s sentimentality demands that viewers engage emotionally with the narrative. As critic David Toussaint writes, “it’s not a feel-good movie; it’s a feel-it movie”. Even its focus on memory and nostalgia can be read as what film academic Michael D Dwyer describes as “pop nostalgia” that helps “structure the way that we collectively ‘feel’ the past”. 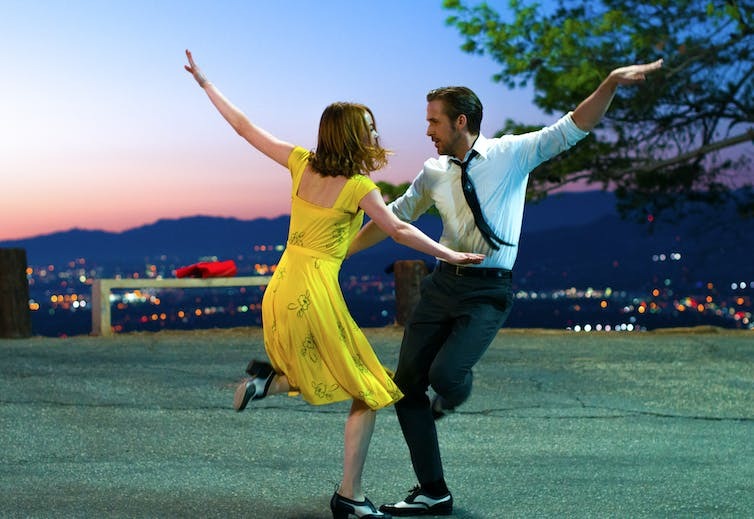 At a time when arts funding is threatened, when libraries face closure and when celebrity trumps more “meaningful” artistry, La La Land resists indifference and celebrates the enduring power of creativity to colour our lives.